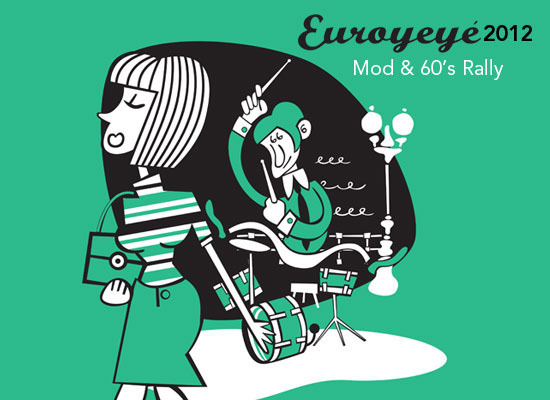 You can travel back to the 60s this summer at The Euro Groovy Weekend Festival in Gijon, Spain. The weekend of 4-6 August is dedicated to everything associated with the swinging 60s. Mod culture, music and cultural and musical events are just some of the things you can experience at the festival. With a vintage fair, record shops and several club nights with international dj’s, including a few from the UK, this is definitely the place to be. If you’ve got a band, we recommend you enter the battle of the bands three of which will be handpicked by a jury to go head to head in a competition where the prize is two days of free recording in a vintage record studio to produce a 45” edition vinyl. How cool is that? There are also 60s cult film screenings throughout the festival. Our favourite is “Wind in the Street”, a classic from 1968 where a 24 year old becomes president. Spend your days lounging on the beach whist listening to the afternoon djs blasting out your favourite 60s tunes, have a stroll among the vintage clothes stalls or pick up a copy of your favourite vinyl. Is there a better way to spend a lazy holiday weekend? We think not. If you want to take part in the psychedelic 60s, dress up as Twiggy and jump on the ferry to Calais. From there it’s about a day’s drive to Gijon. With the Tour de France now under way you may be getting the urge to do some touring of your own. 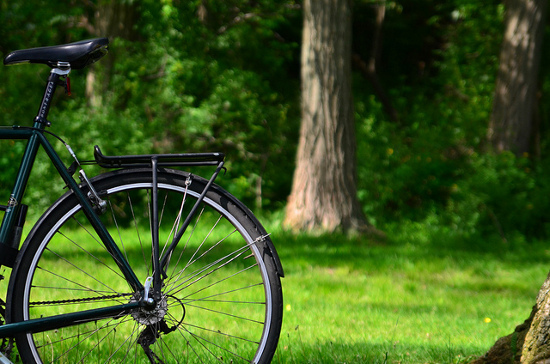 With P&O Ferries, the cycle paths of Europe are open to you for just £29 per passenger. You and your trusty steed can cross the channel and pedal your way through the cities and countryside of France and then on to rest of Europe. A cycle holiday is great way to explore France at your leisure. Riverside routes (blueways) will take you through some major cities so you can sample some urban living, while scenic country roads (greenways) are superbly signposted so you can pick up a good pace without having to stop and check a map at every turn. Some of the old expressways in France have now been converted in to cycle paths so there’s no need to dread the dangers of speeding cars and trucks, these roads are maintained exclusively for cyclists. The blueways link some of the larger towns and cities together so you can cross open country and stop in a different hotel for the night to rest up, before hitting the road the next day. Major rivers like the Rhône and the Seine each have ‘bike only’ roads that you can follow to the sea and relax on the beaches of Southern France If you link your journey with greenways all of Europe is open to you. For example, the Eurovélo project connects France to its bordering countries so if you feel like braving the Pyrenees you can cut right through wine country and stop for some tasting on your way down to Spain. Alternatively when booking your Dover-Calais ferry you could plan your return by a different route, and cycle along the North Sea returning to England via Holland or Belgium. Using these cyclepaths you’ll be able to loop south into Europe and head as east as you fancy; the Eurovélo project also has preplanned routes for you to cycle safely and get the best out of your tour of Europe. P&O ferry’s Dover-Calais service runs multiple times a day, get an early ferry and really get some miles under your belt before the first pitstop on your bike tour of Europe. A rather unique and very interesting exhibition in Brussels explores the past, present and future of America, a nation that is very much tied to Europe. 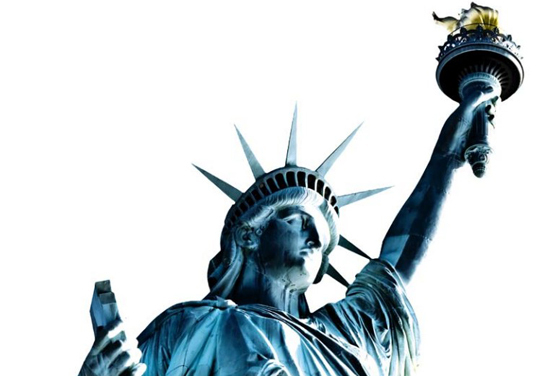 Rosie Khdir Khdir takes a look at America, It’s Also Our History. The Museum of Europe has chosen to mark the Belgian Presidency of the European Union with an exhibition that shows visitors how the unique relations between America and Europe have progress through the good times and the bad. A series of contemporary artists will show their works that tell us more about how they see the relationship between the two powers. Among the artists is Thomas Israël whose work, entitled Peeping Tom, looks at how Europe and North America look to and constantly follow each other. Isabelle de Borchgrave has created a quilt, reminiscent of American Folk art that illustrates the European contribution to the demography of 19th and 20th century America. A very powerful and perhaps controversial piece by Dominic McGill shows a red velvet-lined suitcase which holds within it a ceremonial hammer and sick, covered by spider webs; an artwork that represents the fall of communism and the end of the power struggle between the East and West. This expo has on display so many beautiful artworks of all different mediums, from video to textile, and truly is a remarkable way of telling the story of the relations between the USA and Europe. If you would like to visit the Museum of Europe and see the America. It’s Also Our History exhibition then P&O Ferries can help get you there. P&O Ferries has a Hull to Zeebrugge overnight service or you can take the Dover to Calais crossing starting from just £30 for a car and up to nine people; from Calais it is just a few hours’ drive to Brussels. Due to the coming cold season a trip to the heart of Spain may be just the ticket to raise spirits, and get you through the winter. La Mancha, the largest province of the Iberian Peninsula hosts a wealth of attractions to fill your journey with excitement and wonder. A journey through La Mancha is a history lesson in itself, a tour of monuments and castles that date back to just about every century of western civilisation can be found. These tours will give you some idea of all the various peoples who inhabited this plain and the massive defensive and religious structures they raised at the height of their power. These awe-inspiring castles and monolithic cathedrals are matched only by the vast terrain of La Mancha. Some of the most picturesque natural landscapes in Europe can be found here, if peace and solitude is what you desire journey out to the plains and bask in the warm sun and flawless views straight across to the horizon. For a combination of culture and country explore the many museums of La Mancha which cover just about every aspect of the societies that flourished on the peninsula, art, architecture history and much more all have dedicated museums. La Mancha may be of interest to fans of Cervante’s famous Knight-errant Don Quixote, who started his famous journey from this region, you can follow in his footsteps and tilt at the windmills Campo de Criptana, or learn all there is to know at the Quixote Museum and Cervantine Library in Ciudad Real. Fans may also want to give the local cuisine a try, it all comes from local produce and whilst famous across the world, it is certainly a thing to try at its origin. 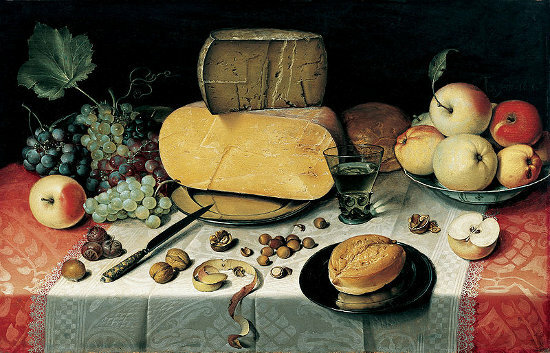 La Mancha wine and cheese is not a thing to miss, and is served up with splendour in the regions Spa Hotels. For a get away to some sun before winter truly kicks in, book a ferry with P&O. 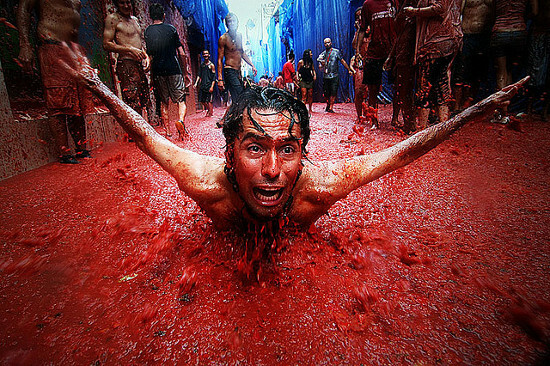 Annual food fight in Valencia, thousands of tomatoes to be slung, lots of fun to be had, Karim Beerahee takes a look. For the last 65 years the small provincial town Buñol, in Spain has paid homage to its two patron saints on the last Wednesday of every August not with quiet contemplation but ritual food fight, in the Tomatina Festival. The genesis of this tradition is unclear, but the resulting celebration is not something to be missed. The cause of the fight has been attributed to a juvenile class war, local food fight among friends, a practical joke on a bad musician and a lorry spill in the town square. What you need to know is that around 20,000 people gather together to pelt tomatoes at each other come the end of the month. The buildup towards the festival is also not to be missed, a week long celebration begins leading up to the fight with parades, fireworks, feasts and street parties. The night before the Tomatina begins you can get a taste of the sizzling cuisine, all tomato themed, to prepare you for the slinging match that begins the next day. By 11 o’clock the next day the town is boarded up and trucks laden with around 90,000 lbs of tomatoes arrive, and battle then rages until there aren’t any left to throw. To get to the Plaza del Pueblo by road: Buñol is 35km (22 miles) west of Valencia off A3 motorway. There is and additional rail service from Valencia. The Pride of Bilbao sails every three days at approximately 9.15 pm cruising for 2 nights. It all comes down to one day, just 90 minutes on a warm Sunday evening and everyone in the world of football will be on the edge of their seats awaiting the final score. Rosie Khdir tunes in to the World Cup Final 2010. Two of P&O Ferries beloved destinations are competing for the FIFA World Cup trophy this weekend in South Africa and we have decided to take a look at the chances of both teams. 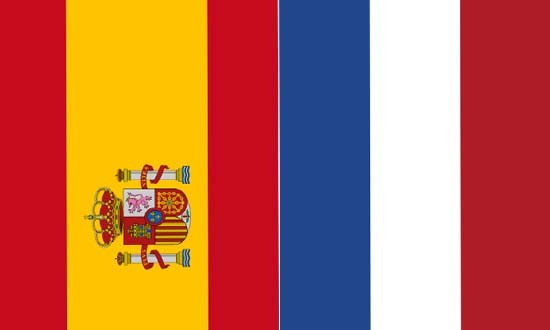 Spain has been a strong team throughout the competition, thanks to the one touch technique, or “ticka tacka” as it is more locally known. They not strangers to winning after the nabbing the trophy in the UEFA European Championship in 2008 and winning the World Cup this year would be another ruby in their crown. But despite being two-time UEFA champions, winning the European Nations’ Cup in 1964 and qualifying for the World Cup thirteen times, they have never won the much revered title of World Champions. In terms of individual player, speculators say the Spain have the better team, and obvious have a lot of experience under their boots. Will this be enough to knock out Holland and claim the price they have lusted after for years? Holland has surprised everyone this year, thrashing their way through the stages and ending up in the final. The Netherlands rarely get singled out as one of the top teams of the world, despite winning The UEFA European Championship in 1988 and reaching the World Cup Final twice before (1974 and 1978). For over 20 years Holland has stayed out of the football headlines, but this year the Oranje (Orange – a tribute to the Dutch Royal Family) are making a come back. The World Cup Final will take place on Sunday 11th July 2010 at 6.30pm GMT. Who will you be supporting? In the run up to the opening games of the World Cup we’re taking a look at four of the qualifying nations served by P&O (sorry Belgium). 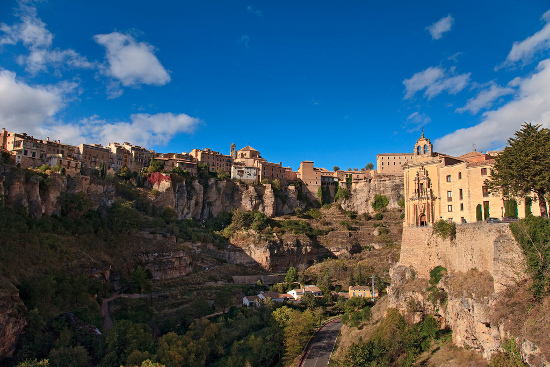 Tomas Mowlam looks at Spain’s chances, and where to go and what to drink if you’re in España. Today we’ve got Spain. They should easily come out top of Group H against Switzerland, Honduras and Chile. Being European champions (picture above) is no guarantee of success, but after qualifying in exemplary style, winning all ten matches and having never lost to their group rivals, they’re bound to be confident. Spain plays Switzerland on the 16 June in the Durban Moses Mabhida stadium. They then travel to play Honduras on the 21 June in Johannesburg’s Ellis Park stadium, before the final group stage game against Chile at Pretoria’s Loftus Versfeld on 25 June. Star players to look out for are midfielder Xavi, keeper Iker Casillias, and strikers David Villa and Fernando Torres. If you’re in Bilbao then check out the old town around Casco Viejo to watch Spain’s group matches, where there will be big screens and plenty of bars. Steer clear of the imported lagers and drink down an Estrella Damm instead; 4.6 per cent and refreshing, just what’s needed after a hard day’s football watching. If you’re in Barcelona then why not check out Universitario, Irish bar Michael Collins, Ovella negra or the massive Sports Bar – worth getting there 30 mins (or more) earlier. P&O Ferries run the Portsmouth to Bilbao ferry service.